Facebook recently introduced "Chat Heads" in its Facebook Home application for Android, and now the feature is about to make its way to iOS devices. Chat Heads work like this: if a friend on Facebook messages you, a small picture of the person will pop up on your screen that you can interact with. 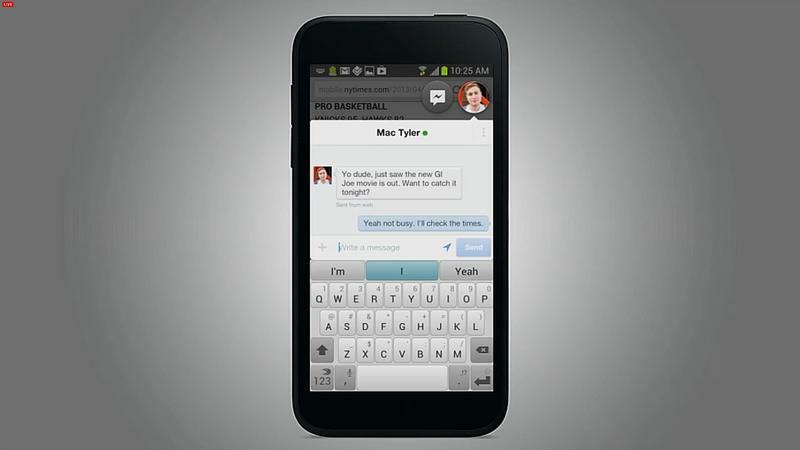 If you tap the face, you'll be able to enter an SMS or Facebook Chat conversation with the contact. There's a catch on the iOS version, however: you won't see the chat heads on your home screen or lock screen as you do on Android, AllThingsD explained. Instead, they'll only pop up while you're using the actual Facebook for iOS application. That's kind of a bummer, but at least it adds a bit more flare to Facebook on iOS. If you want a fully immersive Facebook experience, we suggest you take a closer look at the HTC First (see above), or install Facebook Home on one of the supported Android handsets. Otherwise the chat heads on iOS will have to tide you over for now. Update: The new Facebook application for iOS with chat heads is available now, but only some users are getting the full chat head experience that will roll out to everyone over the next few weeks.